Mickey Rose the TV writer and Woody Allen collaborator has died. Mickey Rose was a childhood friend of Woody Allen and helped him write the early comedies ‘Take the Money and Run’ and ‘Bananas’. The cause of Mickey Rose’s death is cancer, he was 77. Mickey Rose was diagnosed with cancer in January, according to his daughter Jennifer. Rose and Allen, who was then known as Allan Konigsberg, grew up in different sections of Brooklyn but met in a high school art class. They immediately hit it off, according to Allen’s biographer Eric Lax, and became frequent hooky partners, skipping school to watch the Brooklyn Dodgers at Ebbets Field or trek into Manhattan for a movie. “They were just very good friends with similar sensibilities, who laughed at the same things and loved to make each other laugh,” Lax said Wednesday. The friendship endured. Rose and Allen played baseball and were in a jazz band together — Rose played drums — and both later enrolled at New York University, where Allen eventually dropped out. Rose continued, studying film and earning a bachelor’s degree. Rose was among several writers for Allen’s first film, “What’s Up, Tiger Lily?” in 1966, originally a Japanese spy film that was overdubbed with zany new dialogue. 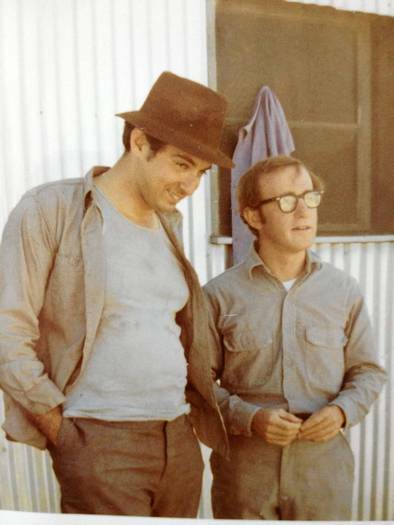 He and Allen then collaborated on the screenplays for 1969’s “Take the Money and Run,” with Allen starring as an inept bank robber, and “Bananas” in 1971, with Allen as a New Yorker who stumbles into an unlikely role in a Latin American revolution. They wrote their material together, furiously tossing jokes back and forth and finishing the script for “Take the Money and Run” in a room at the Plaza Hotel in just three weeks. “There was outright laughter sometimes as we worked,” Rose said of the process, according to Lax’s 1991 biography of Allen. Allen also arranged a blind date for Rose with a friend, Judy Wolf, who would become his wife. She died in 2003 after 40 years of marriage. In addition to his daughter Jennifer, a stand-up comedian, Rose’s survivors include his son Quincy Rose, a filmmaker, and two grandchildren. But by the mid-1980s, his son said, Rose’s opportunities had become fewer and he largely stepped back from comedy writing. His family said Rose and Allen had remained in touch through the years. Emma Watson Taking Pole-Dancing Classes ?? Keira Knightley &amp; James Righton Engaged! Facebook running anti google campaigns?